When it comes down to it, there are casinos that have less to risk than others. For example, the ones on the Vegas Strip really don't have a reason to cheat. The effects of cheating can result in losing their license or legal action. The places that are most likely to cheat are the ones that are not followed up by the Nevada Gaming Commission, which largely takes place on cruise ships. These ships don't have to worry about being governed by the commission because they are constantly travelling. Since the ships are at sea, it's difficult to monitor their actions or even accuse them because they cross so many borders. Sometimes, these tactics require more than one person, resulting in both a cheating player as well as a dealer. 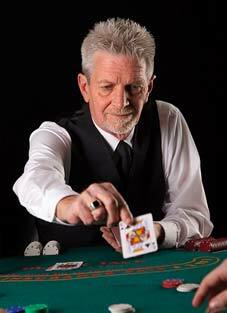 This method of cheating has the dealer handing you a card that isn't the one at the top of the deck. While it may appear that you got the top card, you are given the one below it while the dealer is aware of what the value of the top cards it. This is tremendously disadvantageous because the dealer is then able to use that card when he sees fit, perhaps turning the tables around on you. When played correctly, the 2nd deal can crumble any defense a player has, waiting until the bets are high and then taking it all away from them. This cheating strategy will occur when there are a lot of things going on. While everyone is distracted, the dealer will pretend to shuffle the cards, but will not actually do it. This means that the cards are in the exact same order as before, giving the dealer a tremendous advantage. The reason why this information is being released isn't to keep you from playing at a casino. It also isn't to teach you how to pave your own cheating path. Knowledge is power, especially when it comes to playing at a casino. You are risking your money, and you need to be aware of the ways that you may be cheated out of it so you can avoid it or leave. Casinos make the most money off of people who don't know what they are doing, which is why you have to be informed. Just because you didn't know doesn't mean that they won't use these tactics against you. Be sure you know what you are doing and stay vigilant. Watch your surroundings closely, and if things don't seem right, stop playing. Don't let the casino get the best of you. If you gamble, do it for fun.